This morning we were treated to an amazing Kindergarten Music Share. Thanks to all the families who came and supported this event. Music Shares have become an important part of our musical programme here in the Elementary School, as we feel strongly that all students should have opportunities to perform in front of an audience (especially their families) and experience the excitement of being on stage. A big thanks to Nicola Fader, and the Kindergarten teachers for making this such a special event. With under two weeks left of school, there is a lot happening as always at this time of the year. We have families leaving our community in December, and we would like to invite all parents to our farewell assembly on Thursday, December 15 @ 8am in the Theatre. It is important that students (and adults) have closure when leaving, and although this can be a sad time, we know this is an important part of the transitioning process. Yesterday, I sent an email out to the ES community regarding Online Report cards. We are excited to be introducing electronic, paperless report cards this school year. Not only will this be more efficient and environmentally friendly, we also believe it will bring us in line with other leading international schools who report in this way. ES Student Report Cards will be available to parents online from 9:00am, Wednesday, December 14. ES Student Report Cards can be printed by parents and/or saved as a PDF file. We will no longer be printing hard copies for parents. ES Student Reports Cards can be accessed from the AISJ PowerSchool Portal (https://powerschool.aisj-jhb.com/public/) PLEASE NOTE THAT POWERSCHOOL IS DIFFERENT TO THE AISJ WEBSITE YOUR HOMEROOM TEACHERS USE AND REQUIRES A UNIQUE USER NAME AND PASSWORD. Parents must have an AISJ PowerSchool account, with a username and password, to access their child’s report card. We strongly urge all parents to check that they can log on to PowerSchool as soon as possible (https://powerschool.aisj-jhb.com/public/). PLEASE DO NOT LEAVE THIS UNTIL THE LAST MINUTE. All parents at AISJ have previously been sent Access ID’s in August, 2016. You will require these in order to set up your PowerSchool account and assign your children to your account. Many of you have already completed this step as you updated your demographic information. If you have forgotten or misplaced your Access ID, please email powerschool@aisj-jhb.com. An access ID is for security reasons, and only needs to be used the first time you set up a PowerSchool account. For parents who arrived at AISJ after August, and have not yet received an Access ID, these will be emailed to you today. We recommend using Firefox or Google Chrome browsers on your desktop or laptop computer to access AISJ PowerSchool and the report cards. You may experience difficulty using Safari or Internet Explorer. Report cards cannot be generated via the PowerSchool mobile app. The following links are designed to support parents in creating PowerSchool accounts and accessing Online Reports. If you have any difficulties with this process, please email powerschool@aisj-jhb.com and we will be glad to help. 1. FIVE DAYS (5) advance notice is required from families for report card/transcript printing. Requests should be submitted via email or in person through the respective divisional offices. 2. Divisional offices will only print ONE complete set of report cards/transcripts for each year requested. 3. If parents require multiple copies of report cards/transcripts, it is their responsibility to make copies off site. 4. If an official AISJ stamp is required on the documents, parents will be expected to make the required amount of copies, deliver them to the school, at which time stamping will be completed by school personnel in the main reception of AISJ (stamping will not occur in the divisional offices). 5. With the exception of the final report card, issued at the end of the school year, stamping of all documents will be completed within 10 working days. All other report cards/transcripts required must follow the process outlined in steps 1-4 above. On Tuesday, December 14th, Nicola Fader is holding our annual Grade 1 Music Share. This is an opportunity for parents to come and watch their children perform all they have been learning in music. We encourage you to bring your cameras and enjoy the event!! Please send in a small amount of money. We have found in the past that students who can’t participate feel left out– anything from R20 but no more than R200. It is important to put the money in a marked envelope or zip lock bag. Please write your child’s name as well as the amount of money you have sent to school. Please talk with your child about the importance of not sharing their money with others. Please be aware that your child will be making choices about what to buy and that the teachers won’t be influencing their choices. If you would like to join your child for the shopping trip please see the schedule below, or spend time after school shopping together for some lovely holiday gifts. Parents of Pre-K- Grade 2 students who would be interested in helping chaperone our younger students during this shopping trip, please contact your child’s teachers. Parents are invited to bring along a picnic, blanket and enjoy the festivities, carols and student performances. 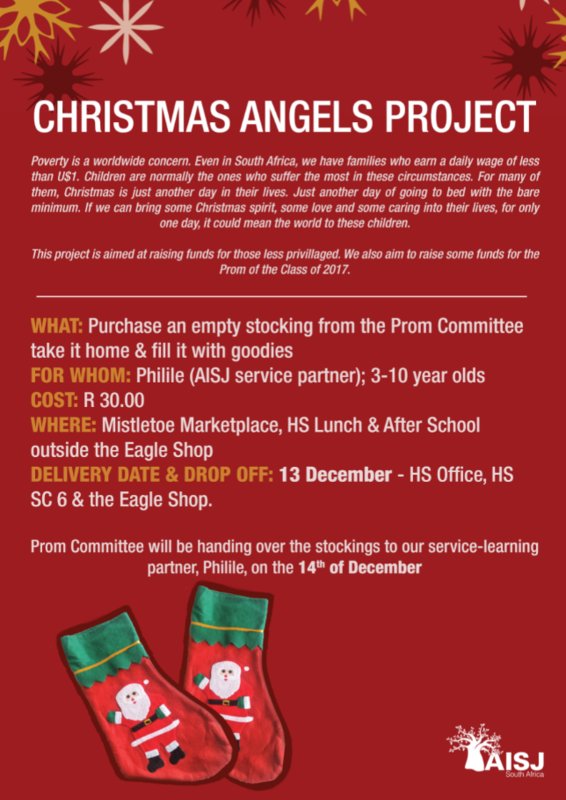 It is open to all members of the AISJ community and a nice way to get into the Christmas spirit. All Grade 5 parents are invited to come to the Grade 5 classrooms on Monday, December 5 at 3pm to learn more about the Grade 5 CWW experience at Maraneman Camp in February.